Are you committed to sustaining earth’s natural balance and looking for ways to have a positive impact? Why not try beekeeping? Surely you’ve heard of the declining honey bee population, but some facts you may not know: An estimated one-third of our diet in the U.S. depends on honey bee pollination. And nearly three-fourths of crops that are responsible for 90% of global food sources rely on bee pollination. What’s more, the financial implications are enormous — experts estimate that bee pollination contributes to more than $10 billion in agricultural crop values every year. So, maybe you’re wondering, how can one person make a difference raising honey bees? Even one colony can provide enough pollination to drastically increase your surrounding vegetable, fruit and flower garden production. It may be a small mark, but it makes a huge difference in your local community. And beekeeping has personal benefits beyond helping the environment. Each year, just one hive can produce 30 pounds of honey, which you can enjoy as a family and sell at your local farmer’s market. Beekeepers also rave about the personal gratification they get from helping their hive thrive and being able to share the amazing process with family, friends and neighbors. Honey bees are pretty adaptable to their environment and can live almost anywhere. What are the ideal conditions for having a productive apiary? Honey bees don’t fly when temperatures are below 57 F and above 100 F. And they need a source of water fairly close by, so if you have a river, lake or stream within two miles of your hive, you’re good to go. Honey bees will travel up to two miles to collect nectar, but their honey production is best if your hive is closer to spring and autumn nectar sources. And your surrounding plants will surely benefit from your bees! If you’re considering backyard beekeeping, check with your local ordinances and your homeowner’s association to make sure you’re allowed to have bee hives. And be a considerate neighbor. Make sure your neighbors are on board with you raising bees. Obviously if you, anyone in your family or neighboring homes are allergic to bee stings, this is not the hobby for you. Beekeeping is a safe undertaking, but you will get stung occasionally. You’ll want to invest in some protective clothing, which we’ll discuss below. Honey bees sting when aggravated, but if you use caution, you can minimize your chances of getting stung while tending your bee hives. Beekeeping is a surprisingly inexpensive hobby. You’ll initially have to put some money into equipment, the hive and purchasing the bees, but once you’ve established your colony and it starts producing honey, you’ll earn back more than you put in by selling the honey. 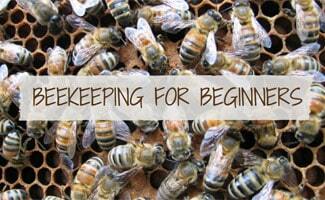 We’ll give you a rundown of how to start beekeeping, step by step. There’s a lot to know about beekeeping and having a successful hive, so we recommend purchasing a guidebook as a hands-on resource. We recommend The Beekeeper’s Bible: Bees, Honey, Recipes & Other Home Uses . When Should You Start Your Hive? Planning ahead is key. If you live in the U.S. southern states then you can start earlier in the spring. But if you live in northern U.S. states, you should wait until mid-April into May, depending on how far north you live. But don’t wait too long to begin once the weather starts turning warm — your bees need enough time to establish their hive and produce enough honey for them to survive. Where Should You Place Your bee Hive? You should locate your hive in the most optimal place on your property to ensure the survival of your bees and optimize their production. See below for some factors to consider regarding where to place your hive. Make sure your bee hive is sheltered from windy conditions. Don’t place your hive on the top of a hill; rather, put it in a valley on your land. Place your hive where it gets the best morning sunlight. Bees become active and productive when they’re warmed by the morning sun. But if you live in a much warmer climate, make sure you’re not overheating the hive — honey bees will overheat if their hive is in a location with a full day of hot sunlight. Your hive should be fairly close to a source of water, as we discussed above. Honey bees need to be close to nectar producing plants, trees and flowers, which are numerous. Some common nectar sources include: maple, elm, tulip and apple trees; blueberry, raspberry, blackberry, honeysuckle, azalea and holly shrubs; vegetable and herb plants: melons, chives, asparagus, soybean, oregano, sage, thyme; ornamental flowers, including marigold, aster, goldenrod, poppy and others. Protect your hive with a high fence or a similar barrier if you live close to streets or populated areas, especially if you’re venturing into urban beekeeping. A barrier forces your honey bees to fly upwards, over cars and people. What Beekeeping Equipment Will You Need? There are a number of basic supplies you’ll need to get started. You may be able to find a local beekeeping store or hardware store that sells beekeeping supplies. There are several websites that specialize in beekeeping supplies, as well as a good selection of equipment on Amazon. Below we’ll give you a rundown on essential supplies you’ll need and give you some of our recommendations. Most experts recommend that beginning beekeepers wear a face veil, a full suit and protective gloves. You won’t necessarily need to be covered from head to toe once you’re more experienced handling your hive and you learn how to gauge your bees’ mood. But until you’re comfortable with your bees, it’s a good idea to go all out with a beekeeping “uniform.” Tips: Wear white or light colors and avoid wool or nylon clothing. Also make sure your clothes cinch at the sleeves, pant legs and other potential openings where bees could sneak in. A smoker helps calm agitated bees so you can get into the hive. Although it’s an essential for beekeeping, it’s best used only when needed. Your hive should typically be docile, but your bees have bad days too, and if you need to get into the hive, a smoker will be your savior. Tip: We recommend you purchase a large smoker — the smoke lasts much longer than with a smaller smoker. A hive tool is a necessity — it helps loosen your hive’s frames and boxes. Honeybees seal together everything in their hive with propolis, a resin-like substance. You’ll find it almost impossible to access your frames and boxes without a hive tool. Tip: Purchase a hive tool that has a J hook that makes it easy to lift out the first frame. You’ll run into occasions where you need to brush bees off the side of a hive or combs to harvest honey. Honeybees are fragile, and they get aggravated by a bee brush, so the more gentle the brush you have, the better. You can build your own hive, which takes a good deal of knowledge and a lot of time and planning, or you can purchase one that’s essentially pre-built and takes minimal assembly. There are several different types of hives — the most popular in the U.S. is the Langstroth Hive. It’s compact, easy to maintain and produces the most honey compared to other types of common hives (Top Bar and Warre). A Langstroth hive is ideal for backyard or urban beekeeping. Want a Beekeeping Starter Kit? There are a number of beekeeping kits available online for purchase. If you’re a beginner beekeeper and want a no-hassle way of getting started, a beekeeping kit can be a good choice. You’ll get most of the equipment and supplies you’ll need to jump right in. Where Can You Get Honey bees? So, you have all the supplies and equipment you need in place. It’s time to get your bees, but where exactly do you get enough honey bees to start your own apiary? Depending on where you live, you have a few options. Clusters of honey bees that live in the wild are called swarms. If you live in a rural area with a lot of forestation, you may be able to locate a swarm on your own. Experienced beekeepers say it’s not that hard to capture a swarm, but beginning beekeepers should probably choose another method. There are a few well-established bee suppliers online that offer Packaged Honey Bees for Sale, that specialize in proper shipping of bees. You can also purchase a package from a local beekeeper. A package can include anywhere from 10,000 to 22,000 bees and a sweet food source. Queens are packaged separately, and experts suggest you allow worker bees to slowly become familiar with the queen, so they don’t immediately attack her. Although more expensive, nucleus boxes or starter hives are probably your best bet, as the hive is already established with the queen, workers and drones (it’s not a full hive of bees, just a starter). You can purchase nucleus hives from your local beekeepers. How Is One Couple Making an Impact? A Los Angeles couple started their nonprofit organization, Honey Love, to support and educate the public about urban beekeeping. Watch the following video that highlights the difference just two people can make on our environment. From April 2014 to April 2015, U.S. beekeepers suffered a total annual loss of more than 42% — up from 34% for the previous year, according to a survey by the United States Department of Agriculture. It’s an alarming statistic, which highlights the need for more honeybees and backyard beekeepers. Just one hive in the summer months can have as many as 80,000 honeybees, and bees from one hive can collect more than 65 pounds of pollen every year! Learn more about why bees are dying in this article. Clearly, there’s a need, and if you’re committed to sustaining earth’s natural order, you should give beekeeping some serious thought. What advice do you have for beginning beekeepers? Buzz Off: Why Are Bees Dying? Is The Honey Bee In Danger of Extinction?